As soon as I saw that little flicker of light, I just believed that everything was going to be okay. That the scare was just another way of God confirming how very much I wanted this baby. How very much I already loved this baby. Even as I began to spot again a few weeks later, I convinced myself everything was fine. Called the nurse just in case. And dutifully went in for my blood test. “Probably just those pesky fibroids,” I thought. I even stopped short of propping my feet up. Taking it easy. 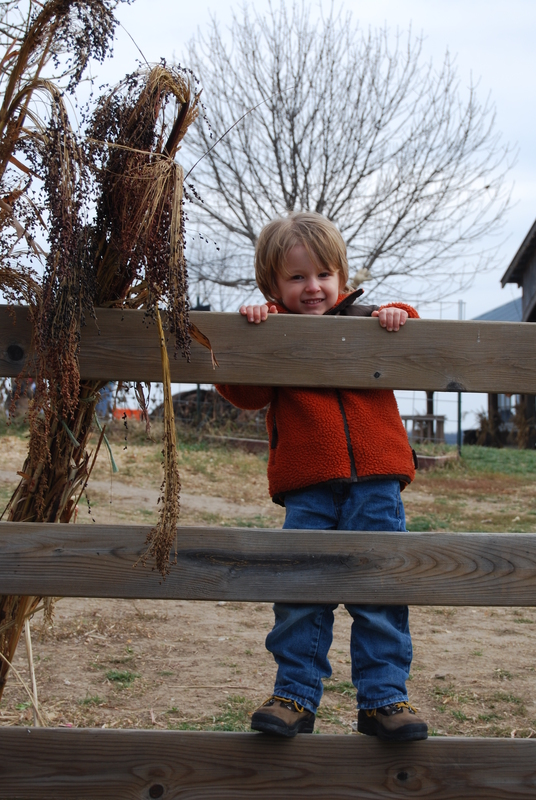 I suppose there was a part of me that wanted to stay glued to the phone but instead, I went to the pumpkin patch. How could I not when my 3-year-old towhead had been talking about this adventure for weeks. It had been a non-stop litany of how he was get himself a punkin’, eats lots of donuts and play with his best friends. So ridiculously darling it made my teeth ache. But on the way there, I mused how ridiculous the whole event might be. Forget being pregnant and feeling crummy. Uneven surfaces were not my friend. Although my balance had markedly improved in the last few months thanks to my rocking physical therapist, I had still had issues in that department. Issues that included a great deal of tripping. And in addition, an even greater deal of falling. And that was on smooth surfaces. So as we got out of the van, collected ourselves, I put Sophie in the umbrella stroller. Made sure Drew was close behind me. Took a deep breath and then held on for dear life. But God bless my boy. And then came the all-preschool break for donuts and apple juice. Although I had a near launch into the rideable tractors, it was, in large part, an accident free trek. We even made it through the juice spill-free. But then I got a little cocky and had the brilliant idea to seize a pumpkin photo op with Sophie and Drew. I tried Andrew solo at first. Got some smashing pictures of the back of his head. Truly magical. And then, out came Sophie. Fortunately, my thought process was interrupted by a conscientious big brother who very aptly pointed out, “Mommy, Sophie is running away.” Truth be told, it was more like “frantic crawling” away. But nonetheless, she was definitely no longer in the pile of pumpkins. I clumsily went after her. Scooped her up and suggested to Drew that this was the perfect time to pick a pumpkin and then we would go. Gotta love a kid who will go along with that. As we fumbled our way back to the car, still chuckling to myself about the “pumpkin incident,” I had the moment where faith came in. I realized it made no sense to give three kids a mom with brain damage. Or a mom who could barely carry herself, much less the three of them. And yet, my God had. We still made it work. We just worked a little differently. And sometimes that’s all faith entails, trusting that God will make it work. Even when it makes no sense. Even when it seems doomed to failure. It didn’t change the fact that I fell into three minivans on the way to our own. Checking one for nearly five minutes to make sure I hadn’t dented it with my elbow. It didn’t remove my self-consciousness at my differences from other moms. Faith just made it make sense. For me. For my kids. For all of us. Triumphantly returning with a pumpkin that looked like the Halloween version of Charlie Brown’s Christmas tree, my boy proudly showed his big sister his treasure upon arriving home. It was indeed a good day. And one where no one fought the dreaded afternoon nap. Satisfied that I had made the right decision for the morning’s activities, I plopped myself on the couch. Began to drift off. Almost forgetting the test results.